COLT shell-and-tube type evaporators are very efficient and require minimum floor space and head space. These are easy to maintain, hence they are very widely used in medium to large capacity refrigeration systems. We offer a premium range of shell and tube type chiller. This has wide applications for comfort / industrial A.C. plants, process water / other fluids chilling plants. COLT is known for the best Shell and Tube Heat Exchanger Manufacturer India. These chillers are manufactured by using the latest technology and can withstand high pressure and temperature. 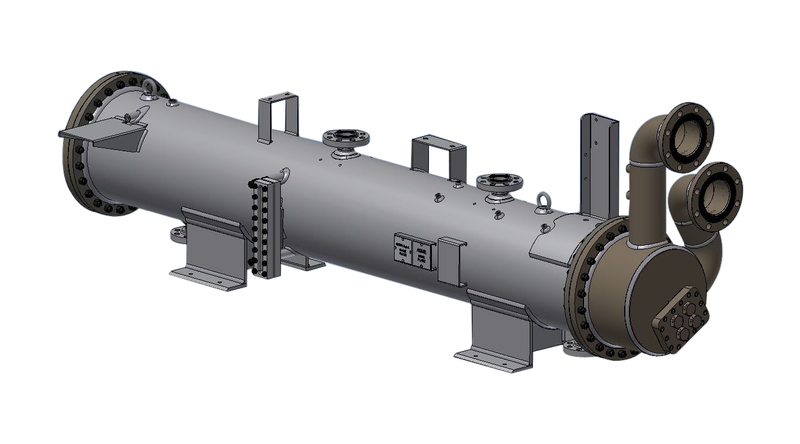 Shell & Tube Direct Expansion Refrigeration Chillers are designed and fabricated under the direct supervision of a team of Engineers well experienced in the line of Heat Transfer Equipment. Every care is taken to ensure a long and trouble free service and the desired performance from the equipment. It is also a type of shell and tube chiller where the water runs through the tubes and the refrigerant flows over the outside of the tubes within a closed shell. Mainly in the flooded chiller approximately 50% to 75% of the tubes are immersed in liquid refrigerant and the space above provides an allowance for the vapor generated through evaporation of the liquid below. This type is more often used with screw or centrifugal type compressors. These two styles of evaporators are commonly used in advantage process liquid chillers. The evaporator is where the process water is cooled during the refrigerant-to-water heat exchanger portion of the chilling cycle.